Diamonds with garnet inclusions can form at depths down to 550 kilometres below the surface. Image: Jeff W. Harris, University of Glasgow. Credit: Jeff W. Harris, University of Glasgow. Scientists studying the Earth's mantle recently made an unexpected discovery. Five hundred and fifty kilometres below the Earth's surface, they found highly oxidized iron, similar to the rust we see on our planet's surface, within garnets found within diamonds. The result surprised geoscientists around the globe because there is little opportunity for iron to become so highly oxidized deep below the Earth's surface. "On Earth's surface, where oxygen is plentiful, iron will oxidize to rust," explained Thomas Stachel, professor in the Department of Earth and Atmospheric Sciences at the University of Alberta, who co-authored the study. "In the Earth's deep mantle, we should find iron in its less oxidized form, known as ferrous iron, or in its metal form. But what we found was the exact opposite—the deeper we go, the more oxidized iron we found." This discovery suggests that something oxidized the rocks in which the superdeep diamonds were founds. The scientists suspect that it was molten carbonate, carried to these great depths in sinking slabs of ancient sea floor. 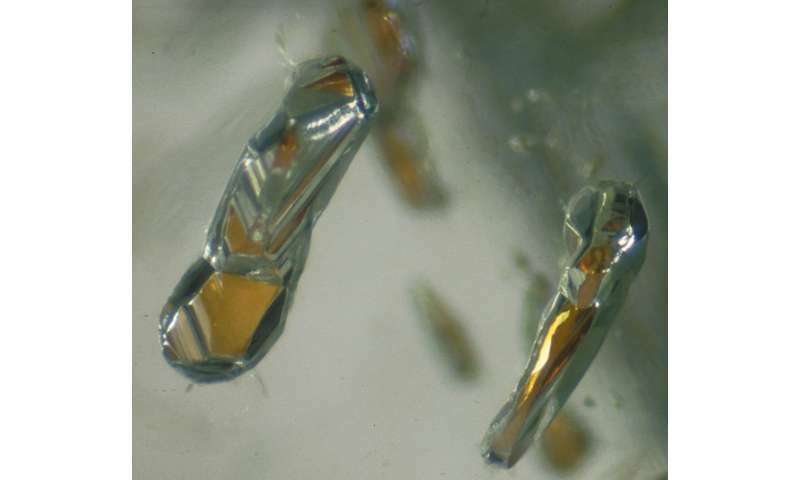 "It's exciting to find evidence of such profound oxidation taking place deep inside the Earth," said Stachel, Canada Research Chair in diamonds. The study also has implications for understanding the global carbon cycle that involves the transport of surface carbon back into the Earth's mantle. "We know lots about the carbon cycle on Earth's surface, but what about in the mantle?" explained Stachel. "Our study suggests that surface carbon goes down as carbonates to at least 550 kilometres below the surface. There, these carbonates may melt and react with the surrounding rocks, eventually crystallizing into diamonds. Diamonds can then be taken down even deeper in the mantle." The study shows that the carbon cycle extends deep into mantle, possibly all the way down to the core-mantle boundary, with billion year storage times. Is this fake news. How in the earth, would they be able to dig that deep? They said they were digging down that deep. "Scientists digging deep into the Earth's mantle recently made an unexpected discovery. Five hundred and fifty kilometres below the Earth's surface, they found highly oxidized iron, similar to the rust we see on our planet's surface, within garnets found within diamonds." The language in the article appears to be using "digging deep" as a metaphor rather than literally digging over half a thousand kilometers. "The temperature would increase from about 1400°C to 1600°C over the depths interval 350 between 655 km." That is a description, probably written by a non-scientist, about the work. There is a difference between a non-scientist-writer's tag-line and the contents of the article, and also between a news article about a paper and the contents of the paper itself. My guess is that Ensign_nemo is correct and the article writer was trying to be clever, using 'digging deep' in the metaphorical sense of 'digging deep into the mystery' rather than literally digging to the ground. But the tag-line writer could also have been misled by the paper author saying "the deeper we go" (meaning the deeper we analyze samples from). In any case, there is no way we can currently dig anywhere near that deep. I think that the Kola super-deep borehole still holds the record at about 12 km (which is only a few percent depths discussed in the article). Natural samples from the deep (>200 km) mantle are extremely rare, and are usually only found as inclusions in diamonds. Here we use synchrotron Mössbauer source spectroscopy complemented by single-crystal X-ray diffraction to measure the oxidation state of Fe in inclusions of ultra-high pressure majoritic garnet in diamond.